Hello. I would like to install Aros on my spare hard drive. I've installed AROS years ago, but now I'm using a new PC and cannot install AROS due to my keyboard and mouse not functioning. 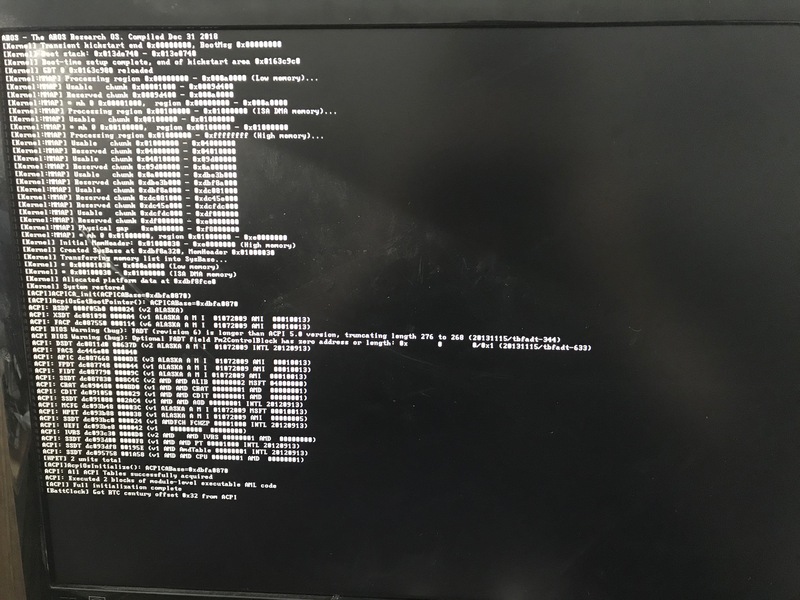 I can boot into the desktop on Aros, but when I boot into Aros, my keyboard and mouse stop working so I cannot proceed with the install. I have a bunch of USB 3 ports and have 2 usb 2.0 ports. For example: My mouse will light up, then when I boot into Aros, it will stop lighting up. What do you recommend I do? Thanks for your time. Re: Installing IcAros on my PC. Aros doesn't detect my keyboard and mouse. You probably need a wired keyboard and mouse. Also, plug them into the USB 2.0 ports as AROS is known to often be incompatible with 3.0. I have 2 usb 2.0 ports on my motherboard and tried plugging the wired keyboard and mouse in, but I have the same issue. I put my motherboard in another case that had 2 more usb 2.0 ports and that had the same issue. The keyboard and mice will work in grub, until I boot into Aros. Edit: I will try the latest version of Aros and see if that will resolve the USB issue or not I'm having. Edit again: I will also check my bios settings before I try boot from cd. There is ZERO support for USB3.x, also even if your motherboard looks like it has USB2.0 connectors in reality they may just be USB2.0 ports from USB3.0 hub (integrated on your MB) attached to XHCI(USB3.x) controller. I had the same problem with a Gigabyte MB. The only solution was to buy a PCI USB2 board from Amazon, which fortunately works fine. I’ll give that a try. Which pci board did you buy off Amazon? Edit: I found a Startech USB 2.0 PCIe 1x card, so I'll just buy that. I got my card today and the ports work in Windows, but not in bios. Maybe I have to disable or enable a setting, I'm unsure. Besides that, I tried booting into the latest version of IcAros and now it will show the text boot and freeze before loading the desktop. I can post a photo of the boot or something else if you want. I'm not sure if this is a issue due to something with the bios, or maybe AROS is having a issue with my new USB 2.0 PCI Express 1x card. I tested the disk and can boot with virtualbox, so it must be a hardware issue or a bios thing. Exit: I think I fixed the boot freeze. My oculus rift sensor was still plugged in. Unplugging it allowed Aros to boot. The mouse still doesn’t work though. It's definitely worth having a poke around in the BIOS to see of the onboard USB can be disabled, and hopefully that would get the USB 2.0 card working. I will see if that is possible and hopefully that will solve my issues. Edit: if I remove the card, Aros will boot, but not if I put in the card. I might of fixed it. After disabling usb3 xhci handoff and enabling ehci or whatever, it boots with the card. Edit again: it works. I will install on my spare hd. Edit again, again: AROS wont detect my spare sata hd, so I'm going to figure a way to get it to detect my spare hdd. Good to hear there's progress with the USB. Unfortunately, I found with my Gigabyte board the onboard SATA was also not recognised, so that was another Amazon puchase PCI card (https://www.amazon.co.uk/gp/product/B00MOHHR12/ref=ppx_yo_dt_b_asin_title_o05__o00_s00?ie=UTF8&psc=1). AROS will mount hard drives from it but not boot from them, so I had to put the sys: partition on a USB stick and boot from that. Anyway, I hope you have more luck getting your hard drive to work. I think my motherboard has a built in external sata port, so I might try that. Edit: I remember AROS seeing my windows EFI partition, so I'm formatting a large spare HD to Fat 32 and will see if Aros can find that.